Movie Review: “Honour”, Shan Khan’s directorial debut on feature film, pointedly conveys a strong message, which doesn’t indicate that the means of expression chosen to do it have been the most appropriate. After the opening statement: ‘life is nothing without honor’, our attention is captured by a British couple provoking two Muslim women on a train. After a while we’re presented with a hideous crime – a brother (who also happens to be a well-connected cop) killing his sister, Mona, with the help and approval of his mother. The London-based Pakistani family was perpetrating what they call an honor killing, since Mona was planning to run away with a Punjabi man who was pledged to marry with another woman since childhood. Going back in time, the story leads us to the moment where the family hires a solitary bounty hunter to track her down, without ever dream that a dangerous empathy between hunter and prey could be possible. After the first hour, the fantastic mood was turned upside down when Mona, presumably dead inside a box, decides to rise up and run away once again. From then on, the film falls on cliché and predictability. 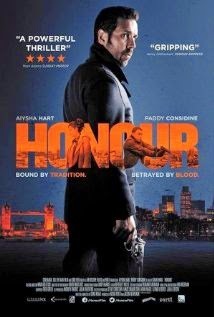 The thrilling elements needed are there, along with an effective direction, but the plot hampered the chances of “Honour” become more valuable. The vile collective madness of a family boosted by its strict tradition is slightly confronted with the difficulties of living within a total different culture. A good idea needing maturation to better captivate us. Good performance by the talented Paddy Considine, though.